Now 35 years on and the world we see through the eyes of the media is often presented as being far from peaceful. 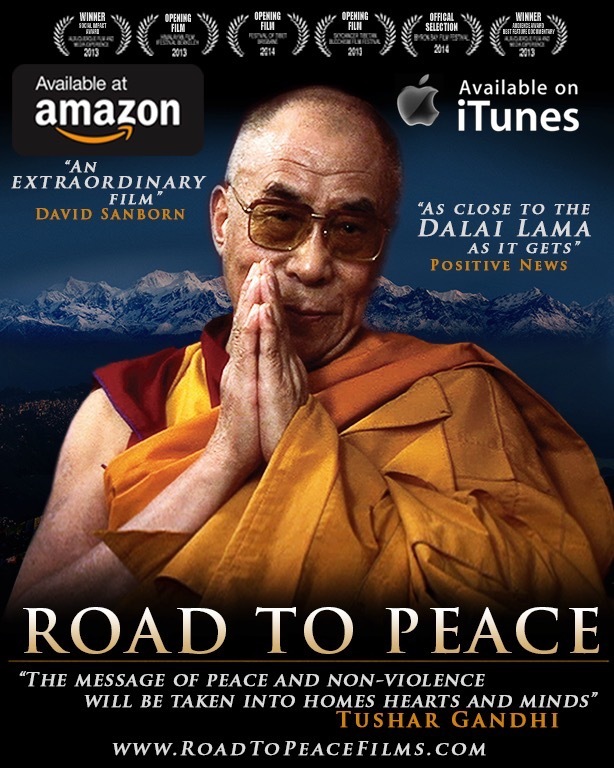 In 2008 I was fortunate to spend two weeks with the Dalai Lama, exploring what the Tibetan Spiritual leader and 1989 Nobel Peace-Prize winner’s message of peace really means. Beginning to understand his philosophy of peace through personal change resulted in the film Road to Peace, and profoundly changed my life, by helping me to discover the source of my own inner-peace. 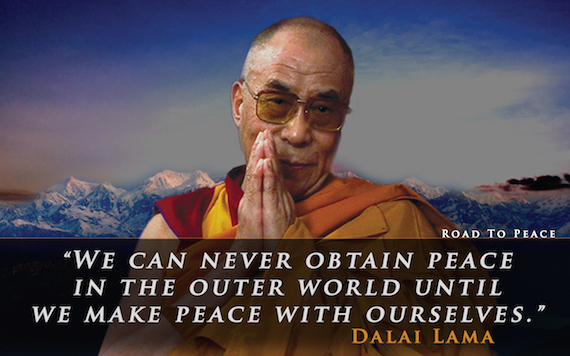 But, of course, this man of Peace presents a particular approach to creating peace in the world. I went on to learn about the many different approaches to creating peace, and indeed, the multitude of definitions of peace itself. And it is through the multiplicity of the definition of peace that we see how important it is to recognise that every story and motive for creating peace is utterly unique. There is no one-size-fits-all solution to end the suffering that erodes the natural state of peace in which we aspire to live. When my personal exploration of peace started back in 2007, the subject in the West was largely couched in Global Ceasefire, the end of wars and Nuclear Disarmament. My family hail from former Yugoslavia and as a teenager we witnessed how the country was ripped apart by civil war. I saw first-hand accounts of neighbours attacking neighbours, friends killing friends. Sadly, the human-loss and betrayal in war is so well documented that we have become largely desensitised to the images and emotions of war. And along with the numbing of compassion we seem to be propelled to towards the nightmare scenario of Total War. In many ways in the West we are now in a renaissance of human understanding, kindness and peace creation. As we embrace the Eastern philosophies of Hinduism and Buddhism, practitioners of yoga and meditation are bringing great psychological and spiritual benefits to our Capitalist culture. The date of 21st September – the Autumn Equinox – has become a focal point for millions around the world to have a discussion of peace and raise awareness of peace-making activities around the world. It is through this dialogue and efforts that hope and new ideas spring forth to inspire people everywhere. This year we are celebrating World Peace Day with screenings of Road to Peace in Orlando, Florida, at the 2016 Global Peace Film Festival. As a documentary film-maker I may be biased, but I believe that films are uniquely placed to bring communities together to discuss ideas, and inspire a dialogue around very specific creative ideas. 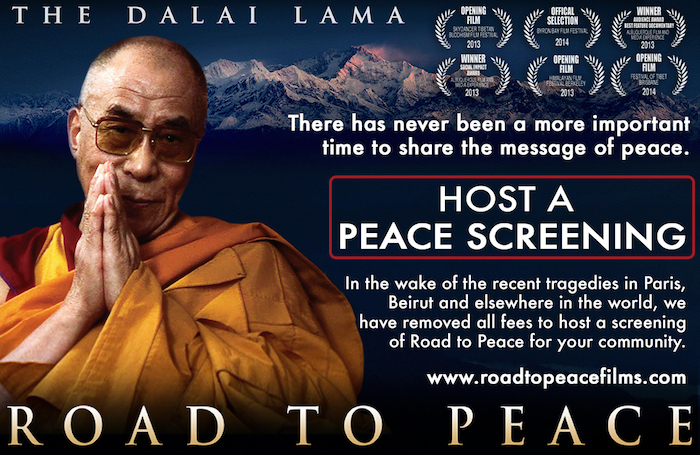 For Road to Peace, I was keen to share an experience of peace. The Dalai Lama is recognised around the world as a ‘Man of Peace’, he has a tangible energy that I wanted to capture and share with audiences of the film. After seeing the example that the Dalai Lama sets as ‘a man at peace with himself ‘and listening to his wisdom, it is easier for audiences to begin creating fundamental changes in their day to day lives. What excites me most about the Global Peace Film Festival, is the embracing of the vast variety of voices not only exploring how we can create peace, but crucially the festival highlights the problems we face around the world that are a direct attack on peace. The point is made loud and clear, in order to solve the problems which we will inevitably face in our lifetime, or in our children’s lives, we must take action. Urgent problems such as Climate Change are unlikely to disappear without us taking a stand and making change. Can that stand be from a peaceful place? Is it possible create a more peaceful world? The films showing in the Global Peace Film Festival present a wide variety of approaches to peace that aim to expand the discussion beyond a single person’s perception of peace. They demonstrate a wide spectrum of views needed in order to bring lasting change, to create a sustainable peace in the world in which we live. 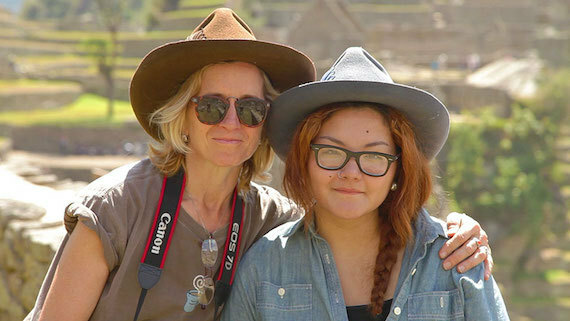 The Anthropologist follows the stories of daughters of the anthropologists, Margaret Mead and Susie Crate, around the world as they document the very real effects of climate change. The realisation this touching and personal film brings is how problems being experienced in remote parts of the world will soon land on our own doorsteps. As anthropologists, they study how the people living in the most effected regions learn to cope with their lands literally falling apart under their feet. Amidst the haunting images of cattle sinking into permafrost in Siberia or villagers standing chest-deep in the sea where their town hall used to be, the film explores the resilience of human beings in the face of extreme change and what positive impacts we can result from a disaster situation. Staying on the theme of Global Change, Women are the Answer examine the imminent population explosion and the effect this may have on climate change. With the number of people on the Planet due to reach between a staggering 8.3 to 10.9 billion by 2050. This documentary looks at equality and education as primary factors of population control in the world’s 2nd populous country: India. 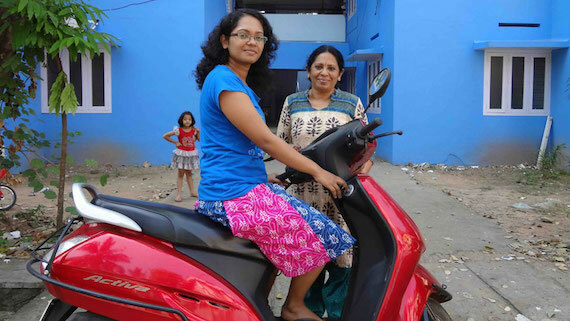 Set in the southern state of Kerala, the film is a breath of fresh air as it highlights the importance and somewhat obvious benefits of treating women with equal rights and respect,​ and establishes the value each person has beyond their role in a capitalist system. This really is the genius of the film festival: presenting problems that would we wouldn’t normally associate with creating peace in the world and showing that finding solutions to inter-personal conflict is just as important to create genuine peace, as it is important to calling for an end to war. A Bold Peace is one of the most enlightening films of our times. This important documentary tells the story of Costa Rica’s vision of peace, as a country that abolished their standing army in 1948. Arguing that true democracy does not require a militarised country, instead relying on the international community’s support to protect its borders. 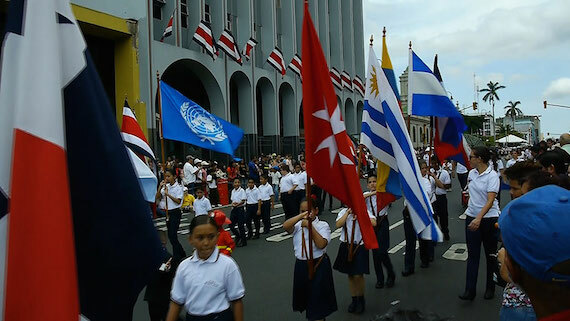 Costa Rica is a living example that peace is indeed possible with a vision of solidarity and social welfare. By rejecting armies and the arms trade, which create a ‘fever of war’. Costa Rica has successfully created a culture of civility and peace, a vision that flies in the face of our current Western world-view of democracy. Remarkably this Central American country’s decision to invest in healthcare and education instead of soldiers and weapons has gone largely untold, until now. It’s clear that without events such as the Global Peace Film Festival, these inspiring films would not get the platform they need to reach their desired audience. To make a film about peace is still a largely isolated venture an increasingly negative media landscape. It’s important to be aware that the motivation of these film-makers and festival organisers certainly differ from the financially motivated blockbuster’s environment in which they compete for space. As the world faces a crisis on many fronts, the power of the medium of film to bring forward new ideas and potential solutions is badly needed. Films and festivals such as these bring awareness to the problems we face and their potential solutions. Not only do they give us ways to cope with the shifting world, but they also focus on the need for positive change for us and for our future generations to flourish in.